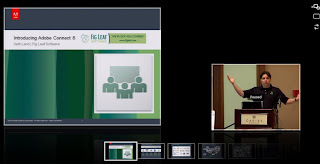 Seth Land, Adobe Connect Guru for Fig Leaf Software, introduced the new Adobe Connect 8 to a live audience at the Sloan Consortium Conference in Orlando, Florida. Fig Leaf Software is an Adobe Authorized Connect 8 Reseller, consultant and training partner. Seth will be leading a series of Adobe 8 Connect Webinars in December 2010 and January 2011 to demonstrate the new features of Adobe Connect 8. To view the Adobe Connect 8 Webinar schedule or sign up to attend the events please visit: http://www.figleaf.com/Products/Adobe-Connect-Webinars.cfm or contact Seth directly at 404-981-3070 or connect@figleaf.com.